Please note: since I wrote this post in 2013, I've written more info about Opalite (starting from most recent) HERE, and more about the difference between Moonstone and opalite HERE, plus HERE and yet another post HERE. I've also included Opalite in my running list of fake gems HERE. Now I see sellers offering Opalite as "Sea Opal" and "Opal Moonstone" or just plain "Moonstone". It is NEITHER opal nor moonstone. It doesn't come from the sea. And of course there is no such thing as a combined "opal moonstone". Recently I saw "Opalite Quartz" or "Opal Quartz"---no, it's not any type of quartz. Opalite is GLASS. I recently read that is might be PLASTIC fused with metal! It does have a sort of plastic-y feel, and warm to the touch. Either glass or plastic, it is not a gemstone. It is not precious. It's not infused with any mineral. It's not really worth very much. It's just a very pretty piece of glass (or plastic). You can buy strands of Opalite beads and briolettes at Michael's for $5.99 and they are clearly marked "glass Opalite". It was introduced to the world in 1988 in Hong Kong. Exactly what is added to the glass to make it glow isn't known, but it is definitely NOT "dolomite" (which is plain grey rock---pavement gravel!) or quartz or fluorite!! That's FALSE. NO minerals are found in this glass. This is just an iridescent glass. I just saw someone online selling Opalite as "Synthetic Opal" or "Opal (Created)". It is NOT a created opal----it's not any kind of opal----it's just glass. 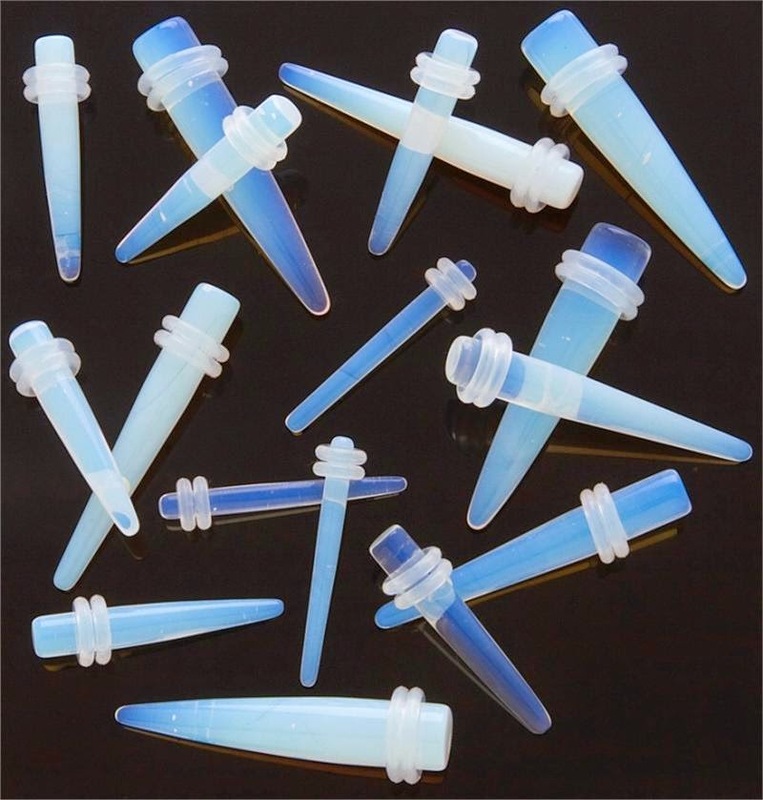 There are also sellers who offer this in crystal "point" shapes and are marketing it as "Opalite Quartz" and "Natural Opalite". Opalite is NEVER natural and is simply carved or molded into those "crystal" shapes. They are perfectly shaped---and a natural crystal is never so perfect. No matter how many times sellers will try to push this glass stone as "quartz" it is NOT QUARTZ, not any type of gemstone, just glass. I just looked on Alibaba (see HERE), and saw Opalite being sold as "Natural Semi Precious Irregular Gravel Chip Argenon Opalite Quartz Stones" for $5.95 for an entire strand. No matter what they are trying to claim, these beads are GLASS, not "Argenon" and not "Quartz" and not any type of semi-precious "irregular" bead. These were formed this way because these are all manmade GLASS beads. Sadly, in reading the comments and reviews for these beads, someone wrote "Very beautiful but some beads are not opalite they are just clear Quartz mixed in." WOW, talk about being misinformed!! Now moonstone---that's a different matter. Moonstone IS a gemstone, of the feldspar family like Labradorite, and come mostly from India and Sri Lanka. They can be white, blue, rainbow, even peach. (Rainbow Moonstone is actually labradorite, but it's accepted in the jewelry industry to call it Moonstone.) They have an incredible glow called Adularescence" or "chatoyance" (inner glow) with flashes of colors that is unlike anything else. Ancient Romans. thought the stone was made of moonlight. It does look like that. It is a stone that is thought to have special powers. opalite glass cabochons (below) in these pictures---they're both bluish and clearish with a certain glow. But Moonstones are a true gemstone that has value, whereas opalite is just mass-manufactured glass or plastic (and is milkier and pinker, and more obviously glass or plastic in person). Opalite has a lovely look with a sort of blue "plasma" glow (see pic below), but doesn't possess the same characteristics as real moonstone which is obvious when viewed in person. I don't know if any etsy seller is just mistaken. Possibly (probably?) 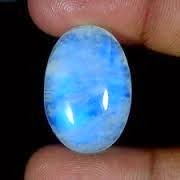 they know very well that they are not selling a gemstone called "opal moonstone" because even if you google that, there is no information for a gemstone called that, but there are plenty of mentions of it being man-made. 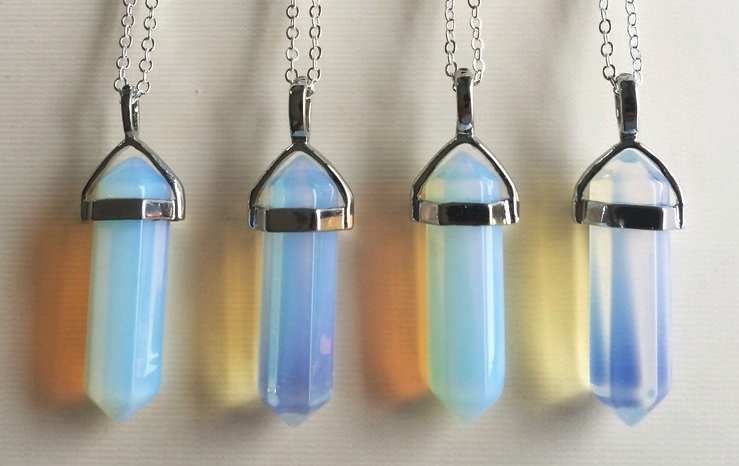 HOWEVER, there are TONS of ebay items (from the Far East, mostly) that are Opalite being sold as "opal necklaces" (for $5.99!) and so forth. That is a blatant RIP OFF if you are thinking it's anything other than glass beads. Buyer beware!! Better yet, ASK the seller if the stone is a genuine stone or man-made Opalite BEFORE you buy it! (Unless you just love the look of Opalite and don't care if it's man-made--it IS very pretty!) And get a guarantee that if you bring it to a jeweler and they tell you it's glass, you'll get your money back! I think a seller will be more likely to tell the truth when confronted. Sad that they are trying to deceive in the first place, but as a buyer, you have to protect yourself! (And my advice: don't buy anything from a deceitful seller who has to be confronted in the first place!) And if the seller just doesn't honestly know that it is a man-made stone (it can happen!) then they would appreciate being educated about Opalite. UPDATE 8.19.13: I was reading a forum online, and they were discussing an etsy seller charging over $60 for an OPALITE necklace that is totally misrepresented as "moonstone". On etsy. NOT COOL. This seller obviously knows it's not moonstone (because basically everyone in the jewelry business KNOWS that this is glass----it's only the unsuspecting and uninformed buyer that is duped!) and is lying to get that sale. SAD. The only reason I'm not linking to it is because I don't want to drive business her way----anyone that tries to defraud buyers is just the worst and should just go away. However, if you go to etsy and search for "translucent round moonstone sterling silver" you'll find the necklace. AND earrings. Bracelet too! They also have this opalite in square glass pieces (as "moonstone") as well. Seller paid about $10 (tops) for a strand of those glass stones. NOT moonstone, not a gemstone----GLASS. About 70 results will show up---over 60 are real moonstone, a carved rose is also Opalite (not opal, etc. etc.) and another pendant is also just glass Opalite. IRRITATING. Makes etsy look bad and drives away customers from legitimate sellers. UPDATE 1.6.15: Here are a couple of pictures of genuine Moonstone cabochons, and a picture of Opalite Glass for comparison. 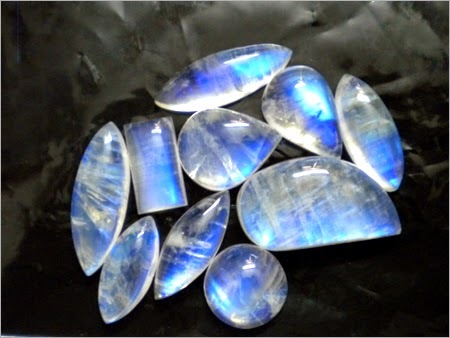 As you can see, real moonstone has inclusions---they look like fractures, but are "layers" which are natural to the gem. These mineral layers are what cause the phenomenon known as adularescence, or schiller, which is that beautiful shimmering glow that makes Moonstone and Labradorite so special! Kind of an interesting side note is Quartz and glass are both made up of the same chemical composition: SiO2. However, there is only one difference and that is the organization of the molecules. Quartz is crystalline (orderly) and glass is amorphous (it lacks an organized structure). When quartz is formed it has all the time in the world to to cool. And the slower it cools the more crystalline the structure and this structure give it strength, thats why its a 7 on the mohs scale only there less that diamonds. But glass being made by man means it cools rapidly and doesn't have the time to form the crystal structure. Kinda like obsidian, natural glass if you will. It has the same chemical composition as quartz and glass but sometimes when a volcano erupts it releases this where it came into contact with the water. Crack it open and you have obsidian. Obsidian and glass both fracture conchoidally (making obsidian a great choice for projectile points) It creates a bulge or 'bulb of percussion' where you struck it and there will be ripples from the shock wave. Break a piece of quartz not only will it be very difficult but you it will preferential break where there are gaps in the pattern. Carol, thank you for your comment! Opalite isn't a gemstone, but it sure is beautiful! I look forward to seeing your angels! Actually, the term "chatoyance" is usually applied to tiger eye, which is rutilated quartz. "... 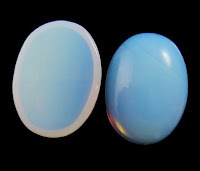 Along with adularescence, some moonstones show chatoyancy, also called the cat’s-eye effect..."
FYI, chatoyancy is found in many different gemstones, including tiger's eye, chrysoberyl, sapphires, quartz, moonstone, beryl gems (including emerald, heliodor, and aquamarine), garnet, iolite, kyanite, topaz, peridot, and tourmaline---just to name a few! Great article, I was suspicious of some opal moonstone for $5.99 (that says it all right there!) but wanted to research it and found your page. Thanks for posting! I'm glad my blog was helpful! Thanks so much for your comment! Yes! Opalite glass is REALLY pretty and that's what jewelry is all about---wearing something you love! I have nothing against opalite, but I wrote this as a warning to people who think they're buying moonstones or opals (sellers misrepresent this as a gemstone). Jewelry is fun, and if you love something, wear it! What, exactly, is a CZ? What is Moissanite?